Solden is a true skiers paradise. You’ll find fantastic slopes, challenges, après ski, shops, clubs, restaurants, bars and relaxing accommodation in Solden, with something for every budget. Set in the heart of the Tyrolean Alps, this is one ski resort with more than simply slopes on offer. This fantastic ski area is often called the Golden Gate to the Glacier, connected by ski lifts to glacier slopes, offering a range of difficulty levels for skiing enthusiasts, reaching up to 3250m elevation. Huge party opportunities and relaxing après ski greets visitors, with a large range of cheap hotels in Solden to boot, making this an affordable winter ski break for more and more visitors to experience. Solden is made up of 67km of blue trails (easy), 48km of red trails (intermediate), and 27km of black trials (advanced), as well as the longest ski trail in the region – from Schwarze Schneide to Rettenbach Glacier. 33 state of the art ski lifts and gondolas transport visitors from the ground to their chosen elevation site, with enough capacity to ensure no queues. Guaranteed snow and no queues? Sounds like a winter holiday and a half! The BIG 3 is in this particular area of Austria, and this is the only part of the country that is home to three different mountains which all reach higher than 3000 massive metres. It is possible to reach the top by ski lift, so you can choose Gaislachkogl, Tieenbachkogl and Schwarze Schneide, with each providing their own difficulty levels and challenges. Of course, aside from skiing, there are other activities to choose from, such as ice skating, ice curling, tobogganing and sledding, or simply kicking back and relaxing with a steaming cup of cocoa in your hand – why not?! 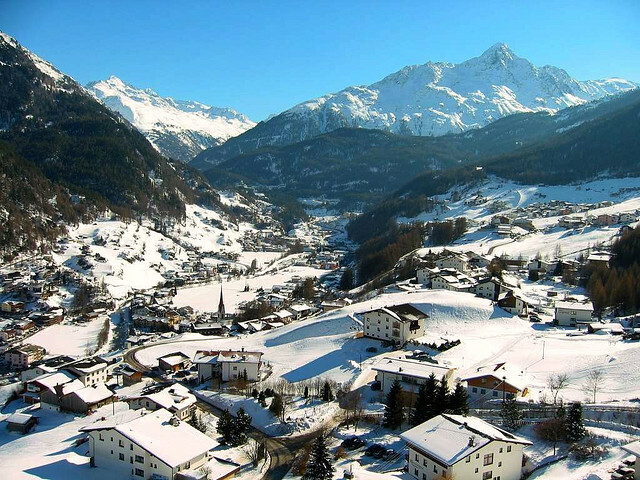 Where to stay in Solden will depend on your choice of slope, and of course your level of difficulty. Having said that, you may not necessarily be aiming to do quite so much skiing, and simply want to enjoy the scenery, maybe give skiing a bit of a go if you’re a beginner, and enjoy the facilities. The choice is truly yours, and that opens up your accommodation choices. There are plentiful party opportunities within Solden’s ski area, with many nightclubs too, such as Snow Rock Café and Mogul Bar and Music, amongst others. There are also many shopping opportunities, and mountain restaurants and cafes, ranging from table service to self service, proving a true holiday destination with energy thrown in. Solden provides holidaymakers with enough challenging and easy-going slopes to suit everyone, and the chance to improve skills and maybe promote onto an intermediate slope if things go well. Instructors are on hand to help those who want to learn more, and you can choose other ice-related sports if skiing becomes tiresome. Solden is a fantastic choice in a truly beautiful alpine setting, if nothing else, you’ll have stunning photographs to remember you time by.